Place the rim block on the rim of the toilet and adjust to the flow of the water. 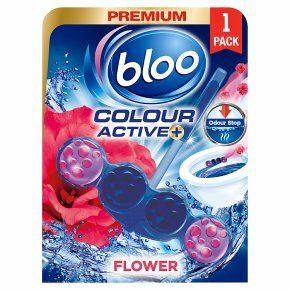 Bloo Power Active Fresh Flowers Toilet rim block 50g<br><br>Warning. Causes skin irritation. Causes serious eye irritation. Harmful to aquatic life with long lasting effects. Contains Delta-damascone. May produce an allergic reaction. If medical advice is needed, have product container or label at hand. Keep out of reach of children. Wear protective gloves/eye protection. IF ON SKIN: Wash with plenty of water. IF IN EYES: Rinse cautiously with water for several minutes. If eye irritation persists: Get medical advice/attention. Dispose of container to recycling. Keep the packaging for later use.